Well the Android Market looks to be getting an “overhaul” courtesy of Motorola who apparently have gone and built their very own Market for Android, with desktop capability and all. Currently called, “SHOP4APPS,” my boys over at Androidandme have used the awesome power of Google search to reveal one of Motorola’s dirty little Android secrets. Unfortunately, the discovery the of the site has led to a takedown as it evidently wasn’t ready for prime time but a key facts were uncovered before the inevitable takedown. When is someone going to open up a multiplatform mobile appstore? First, I don’t think it says anything abouy the market. 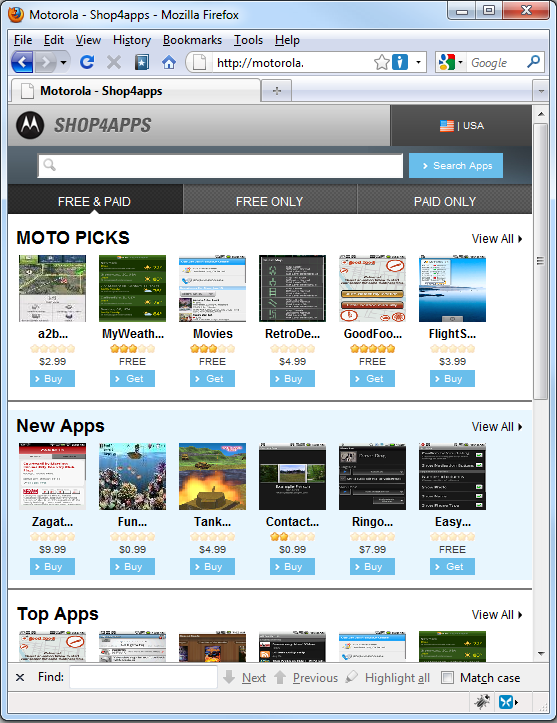 Motorola justs wants a cut of profits from paid apps. Second, there IS a multiplatform appstore. Ever hear of handango? http://www.handango.com. I say they should open it to all Android users (even if they charge extra to non-Motorola phones). …but I doubt this will happen. The benefit of Motorola having a custom market is that they *could* test and/or support the apps in their market on their phones. This would help Motorola users know that the apps will work on their phone.